WASHINGTON, Jan. 23 (Yonhap) — North Korea is pushing to acquire the capability to fire multiple nuclear missiles at the same time, increasing the threat posed to the United States, the head of the Central Intelligence Agency said Tuesday. Speaking at the American Enterprise Institute, CIA Director Mike Pompeo also said the U.S. mission is to extend that timeline as much as possible. Pyongyang last year conducted its first tests of an intercontinental ballistic missile capable of reaching the mainland U.S. It also detonated its sixth nuclear bomb. 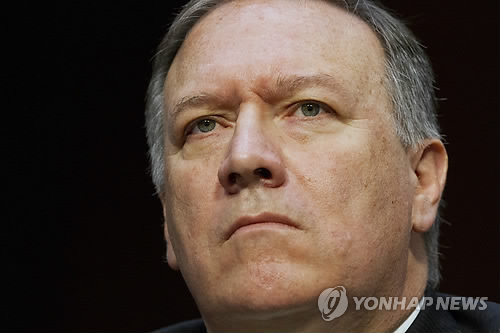 Pompeo has repeatedly said that North Korea is just months away from having the ability to nuke the U.S.
“I want everybody to understand that we are working diligently to make sure that a year from now I can still tell you they are several months away from having that capacity,” he said. The CIA chief also noted that Kim appears to seek Korean reunification on his terms, not just protection of his regime, by pursuing the nuclear capability.